Considered Russia’s premier resort city, Sochi is thriving after hosting the 2014 Winter Olympic Games. New infrastructure has given the popular tourist hotspot a fresh look and has turned Sochi into a year-round destination. The city, however, boasts little footballing culture, and so the newly renovated Fisht Olympic Stadium risks becoming a white elephant. The Fisht Olympic Stadium will look familiar to many viewers of the 2018 World Cup, and that is no surprise. The stadium was built for the 2014 Winter Olympics at the cost of $779 million and served as the venue for the opening and closing ceremonies. After the Olympic Games, it was decided that the stadium would be a venue for the 2018 World Cup, and this decision meant that the roof would have to be removed to make the stadium compliant with FIFA regulations. On January 15, 2015, the $46m million roof removal project was commenced, with work ending in November of 2016. Since its renovation, the stadium has seen little in the way of football matches. Since Sochi’s football club FC Sochi folded halfway through this season for financial reasons, there are no teams in the city to play at the stadium on a regular basis. The 47,000 seat stadium did, however, successfully play host to the Russian cup final between FC Lokomotiv Moscow and FC Ural in May of 2017, though it would not host another match until the Confederations Cup later that year in June. Fisht Stadium saw the likes of Germany and Mexico play on its pitch and averaged an attendance of 30,472 during the tournament. This attendance was the lowest of the four host cities by some 8,000. During the World Cup, Fisht Olympic Stadium will play host to international heavyweights like Germany, Portugal, and Belgium. The stadium will also host a round of 16 games, as well as a quarter-final game. Modern-day Sochi began as a fortress built by the Russians in 1838 to protect lands that they had just annexed from the Ottoman empire. Owing to its warm climate, Sochi became Russia’s only subtropical resort city in 1917, and the Soviet Union opened a railway connecting Sochi to the rest of Russia to promote the city as a vacation location for Russians. The Soviets further improved Sochi’s desirability in a bid to replace the Imperial Russian notion?that Crimea was the nation’s resort location in 1934 by building health resorts in the city and generally building up the infrastructure, to great success. Even Stalin had a dacha in Sochi, such was the popularity of the resort. The status quo of Sochi remained largely unchanged until the year 2014 when Sochi had the privilege of hosting the 2014 Winter Olympics. While Sochi does have snow-capped mountains inland, many Russian citizens were surprised that Sochi, a subtropical resort, was chosen to host the Winter Olympics, especially given Russia’s abundance of cold weather cities. However, President Putin took the bid as a sort of pet project and made it clear that Russia was willing to invest large amounts of money to make the Games a success. Nobody, however, predicted just how much money would be spent on the Games. Initial project estimates quickly spiralled out of control due to embezzlement and systemic corruption, and the games are estimated to have cost a whopping 50 billion dollars, far and away the most expensive Olympic games ever. The high cost of hosting the Olympics did come with its advantages. Sochi received a much-needed infrastructure facelift, with new highways being built for improved access to the city, as well as significant upgrades to the ski facilities in the mountains surrounding the city. These investments have seen some of their value returned already, as Sochi now is a year-round tourist destination, rather than just a summer vacation spot. Footballing culture in Sochi is almost nonexistent, and the city doesn’t even currently have a club. In fact, the city of Sochi has only ever been represented by three football clubs. Zhemchuzhina Sochi was founded in 1991. The club was reasonably successful, spending seven seasons in the top division from 1993-1999. However, the club was relegated and suffered chronic financial issues until they finally folded in 2003. Shortly after the collapse of Zhemchuzhina Sochi, FC Sochi-04 was created. The club never had any real success. Their most notable achievement is that they played in the Russian third tier for several years. They were denied a professional license in 2009 due to financial issues and were promptly dissolved. Sochi’s latest club, FC Sochi, was founded in 2013 and bounced around between the third and fourth division of the Russian football pyramid. FC Sochi was actually so poorly supported that they only ever played one game in Fisht Olympic Stadium, the rest taking place at a small stadium outside of the city that seats 10,000 spectators. The club averaged an attendance of 837 spectators per game. On June 22 of 2017, the club announced that it was going to “take a one year break” so that they could change strategy, leaving Russia’s resort capital without a professional football club. 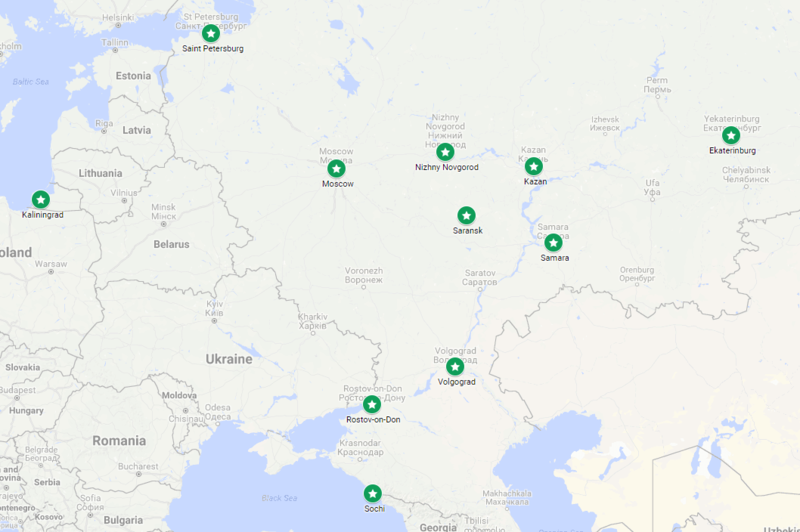 Over the last several years there have been rumours of clubs from other cities, particularly Kuban Krasnodar and Anzhi Makhachkala, possibly being relocated to Sochi. Both Kuban and Anzhi were struggling financially at the time, and it seemed an attractive proposition to move one of the clubs into a fairly large city with a fantastic stadium like Sochi, especially with the World Cup so near. However, nothing concrete came of the rumours and Sochi has remained without a club since the collapse of FC Sochi. Owing to its history as a resort city, Sochi has no shortage of things to do for tourists. 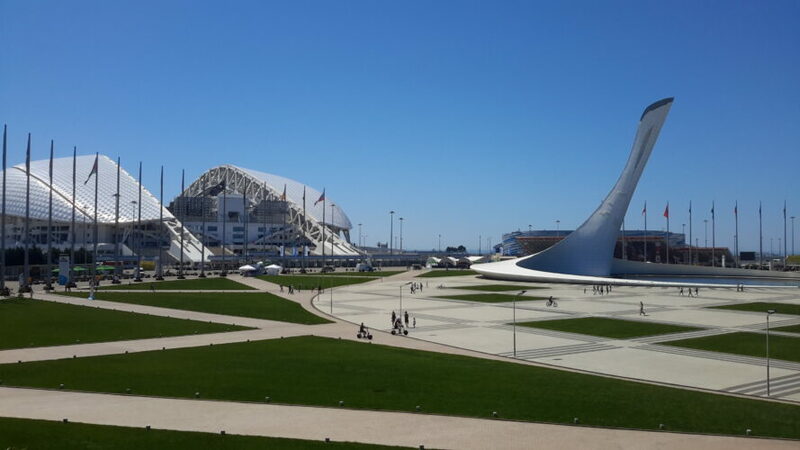 Sochi’s climate is very conducive to summer tourism, and temperatures average between 68 and 73 degrees Celsius in June and July when the World Cup is taking place.? From extreme sports venues to cultural centres to beaches, Sochi is jam-packed with things to see and do. Sochi’s train station, the first part of the city centre that many tourists will see, is an attraction in and of itself. Built in the early 1950s, the station is made out of white marble with large open-air areas, made possible because of Sochi’s climate. The tower clock in the station has become a symbol of Sochi and can be seen from many areas in the city. Besides its beauty, the station is useful because you can get to pretty much any area of interest in Sochi from the station with no transfers, making transport very efficient. Also in the city centre, the Cathedral of St. Michael the Archangel is another landmark that every tourist should stop by. Built in the late 1800’s, the cathedral is covered in white marble and stands 34 meters tall at its highest point. While it was converted into a granary in the 1930’s by the Soviets, today it has been given back to the church and serves as a place of worship for citizens of the city. The Upper Embankment lies on the beachfront along the centre of Sochi and is the place to be for beach lovers. The beach features an outdoor cinema and massage booths along its length. There are also many shops along the waterfront that sell tourist items, as well as cafes and open-air restaurants that run along the Embankment. Moving away from the Sochi city centre and towards the mountain cluster, visitors will be able to experience the vast array of outdoor activities that Sochi has to offer. While Sochi’s now world-class ski facilities won’t be open in the summertime, the resorts still offer an array of attractions to visitors. Rusa Khutor, which is Sochi’s largest alpine resort, offers miles of bike trails, horseback riding, rock climbing facilities, and even dune buggy rides. Gazprom alpine resort, another huge ski facility, converts to a health spa in the summer and features a water park and cinema. Sochi may be far from Moscow, but it’s definitely not one to miss out on during the World Cup. If you have any questions about Moscow or the World Cup, feel free to contact us on Twitter (@Rusfootballnews), on?Facebook?or simply leave a comment beneath this article, and we’ll get back to you as quickly as possible. College student in the United States and avid Krasnodar fan. Sergey Galitskiy is the man.